In addition to Germany, France, and the USA we have met: Canada 12 or more, Australia 4-5, Italy 3-4, Belgium 2, Russia 3, Turkey 1, England 4-5, Ireland 2-3, Poland 1-2, Bulgaria 2, New Zealand 1-2, Brazil 3-4, Spain 4-5, South Africa 1, Austria 1, Switzerland 1, Czech Republic 1, Denmark 2, Netherlands 0. Of course, we have seen hundreds of pilgrims we haven’t talked to so they aren’t included in these counts. A few people have said that they have been meeting a lot of Americans but we haven’t found that. We’ll check the Santiago completion stats when the ones for April come out. When we tell people we are from the United States, they often ask “which state?” We have been surprised that nearly everyone knows about New Mexico. We have met people from Texas, Arizona, and Colorado, the states surrounding NM, but haven’t yet met anyone from NM. 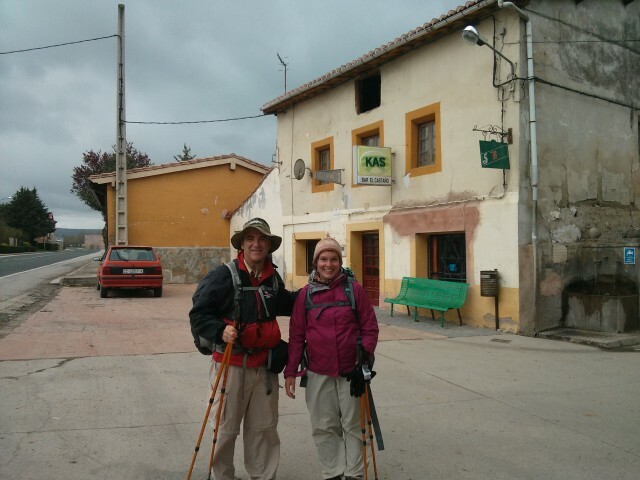 We met the Canadian couple in the photo above shortly before we caught a bus to take us into Burgos. We waved the bus down, per instructions by the nice woman inside the bar, in the spot the photo was taken. What!! You haven’t met Joost from Amsterdam? Since lots of younger people walk the Camino, I think the mix of nationalities changes when the end of the school/college term ends, which varies from country to country in Europe, sometimes by a considerable amount.